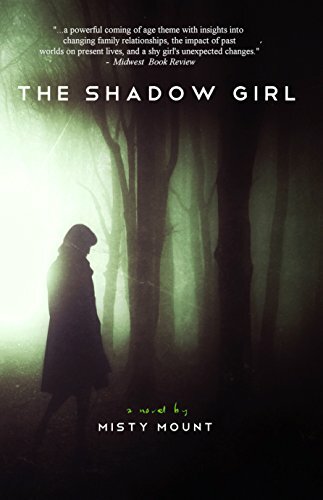 Today is our turn on the blog tour for The Shadow Girl by Misty Mount. Kimberly is reviewing today. Our voice from the USA gives her thoughts below. Sometimes I hesitate to put my hand under an automatic faucet, knowing it may not activate correctly. I then will try another sink or a soap or towel dispenser hoping this isn’t one of those days where I am invisible. Yes, like Zylia Moss in The Shadow Girl by Misty Mount, I often feel unnoticed and unseen, not just a teenage dilemma after all. The idea that sometimes the main character might actually be invisible was a captivating start to the story. The idea that she could get stuck in this state kept me reading. Working in a middle school for a day job, I never shy away from a good YA novel, and this one I would absolutely recommend to any student or adult. The message is clear, you are not invisible, even if you feel you are, and the impact you make will never be completely clear unless you are not there to make it. That message, however, isn’t driven home until the very end. The rest of the story focuses on the mystery that surrounds Zylia and her grandmother’s sister. It is set in the very real life of a thirteen-year-old girl surrounded by five other siblings, parents that are often otherwise preoccupied, school peers, and a super cute boy that she has a crush on, none of whom seem to really see that she exists. Whether you relate completely with Zylia or you are more like her boisterous outgoing friend Terra, there is something for everyone in The Shadow Girl. Great post – we had the same GIF. Love it.